All our dragons are Europeans and therefore are of the same species as the Welsh Dragon, which is still used as an emblem of the Welsh nation. 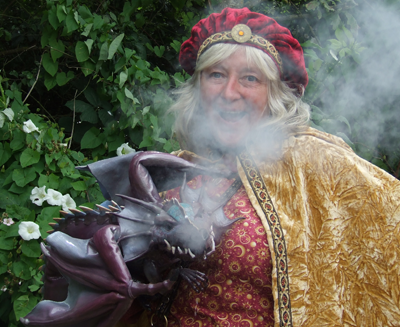 European Dragons are also found in traditional tales from the rest of the British Isles, northern and central Europe. There are certain rules which apply to all Dragons. Believe it or not they don't all breathe fire and neither do they all fly, but they are very long lived, taking many decades to mature. They are elemental creatures and will not tolerate being out of their environment for long periods. Dragons are basically carnivorous, feeding on large prey in much the same way as a hawk preys upon rabbits. Dragon fire is a subject which has been greatly discussed and there is still much debate about just how this works. However it can be said with some certainty that they spit chemicals in the way that some lizards spit venom. However a Dragon has two separate chemicals which are released simultaneously as it exhales, much like a violent sneeze. These chemicals, once combined and mixed with air, spontaneously combust. Natural napalm! Hence Dragons are vulnerable to head injuries and to anything which can reflect their blast of fire back at them. "No Dewi, you can't play in that wind tunnel!" Draco Occidentalis Magnus clearly divides into four distinct sub-species. These creatures have a tendency to live in deep caves or ravines, colouration varying from almost black through to dark sand shades. The adults are both flighted and fiery, however the young can neither fly nor breathe fire. This is fortunate, as it allows us to bring young Sid out in public. Earth Dragons have a tendency to be territorial, hoard treasure and are reasonably ready to rise to the attack if annoyed. However they are very intelligent and will not eat or fry anything which it might be to their advantage to leave alive till later. Earth Dragons were once fairly common. Tradition has it that most pronounced, steep and rocky features in the landscape did, at one time, have a resident Earth Dragon.When handled "from the egg" , they will bond with their handler as if he or she were their mother. This bond becomes very strong so that both handler and Dragon soon know what the other is thinking, at least most of the time. These dragons tend to live in high places unless they can find somewhere at lower altitude with an active volcano. They were never very common except locally, near active volcanoes, where quite large colonies were known to develop. Colouration varies from bright yellowish white to dark crimson red. They are both flighted and fiery, except when young, yet again giving us the opportunity to bring a young example out in public. Earth and Fire Dragons are closely related and cross breeds are possible. Fire Dragons are highly intelligent and not quick to rise in anger. They would sooner befriend than conflict with any creature, however woe betide he who crosses a Fire Dragon. Once prevoked, a Fire Dragon will incinerate all in it's path with the hottest and most persistent Dragon fire known. They will then go into a feeding frenzy on the ashes, which become a highly concentrated food for them. (Don't tell young Phoebe this as she hasn't realised it yet!) Fire Dragons are immune to any form of fire, bar their own. These creatures are very rare and not a lot is known about them. They are a bluish white in colour and spend virtually all their lives aloft, high in the atmosphere. They are possibly fiery but only in extremis. They come to earth very rarely and then only on the summits of high mountains, even then usually at night. This could help to explain why so few people, even historically, have ever seen one. They give birth on the wing to live young, who themselves will fly within moments of birth. It is rumoured that the young will hitch a ride from to time on an adult's back. We do not have an Air Dragon as keeping a young one confined to the ground would be cruel. It would also be dangerous as they are unpredictable and nervous, having a reflex to fly upwards several thousand feet before stopping to think! These were certainly the first Dragons. They are usually greeny-brown in colour and are not fiery. Water Dragons feed primarily on fish, but they will emerge from the water to grab a large animal if the opportunity presents itself. They are slow and cumbersome beasts on land except when very young. As a rule they are flightless, having fins rather than wings. However there is a tendency to mutate and grow wings when stressed, such as by their lake or sea drying up,which probably explains how the other varieties evolved. Water Dragons are not highly intelligent and have no hoarding behaviour. However they are territorial and have an immense appetite, coupled with the ability to grow to enormous size. The Loch Ness Monster is almost certainly a surviving Water Dragon, or more likely a family of said creatures as the legend is older than even the huge span of years that a Water Dragon lives.We are currently investigating the possibility of introducing a young Water Dragon to the public, but this is problematical, the young will start to develop wings very quickly if kept out of water. These creatures appear in some stories and legends. They are most probably a hybrid between Earth and Fire Dragons, demonstrating attributes and behaviour of both sub-species but seemingly growing bigger, living longer and being more intelligent than their parents. Golden Dragons have incredibly sensitive hearing and acute sight. They are empathic with most living things, meaning that they know what you are thinking, sometimes even before you do! A Golden Dragon's habitat is something of an unknown quantity as it is virtually impossible to find one. Let me explain. Being a cross between two different elemental creatures and acquiring the powers of both at an enhanced level, they find the modern world a very crowded and noisy place. Remember they can hear thought as well as sound and they do not like some of what they hear, being noble and honorable creatures. They used to live in harmony with both earth and fire but now they choose live "between" earth and fire, having found, or maybe created, another dimension where they can dwell at peace and with plenty of space. It is very rare for a human to be able to perceive a Golden Dragon but not unheard of! As for introducing a young one to the public, I am afraid to say that there is too much disharmony in our world. The poor thing would probably just hide, shaking, with its hands over its head, slowly fading away to the inbetween place where the rest of its type dwell. These are a sub-species of Water Dragon from the far north. They are an icy bluish-white in colour and as a rule can fly at need. Ice Dragons have a little understood and extremly strange metabolism which is not unlike an industrial freezer, deriving energy by removing heat from their bodies. The reverse reptile effect! This means that they do not breathe fire but rather a jet of air at about -260C and full of steel hard ice crystals. They hate any temperature above -35C, becoming hyperactive and very bad tempered when too warm. Hence they are not generally adaptable to public appearance in Britain.